As I’m sure you know, we love to share beautifully remodeled mobile homes! Whether they are lovingly remodeled by handy DIY homeowners or professionally renovated, we want to see and share them with you all. 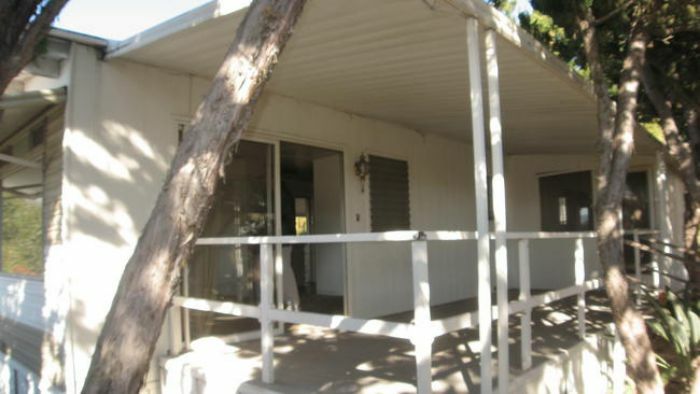 This complete 1964 mobile home remodel is definitely a professional remodel but it is a great example of the possibilities that a mobile home has. I would love to transform my mobile home into something like this! 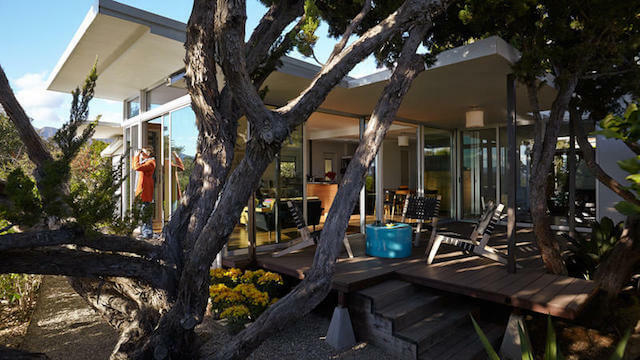 We stumbled upon this amazing complete 1964 mobile home remodel on LA Times. Amy Shock, a designer from Los Angeles, decided she was ready for a change. She had a 4 bedroom home in Beverly Hills but was looking to move to the coast to live and work part time. 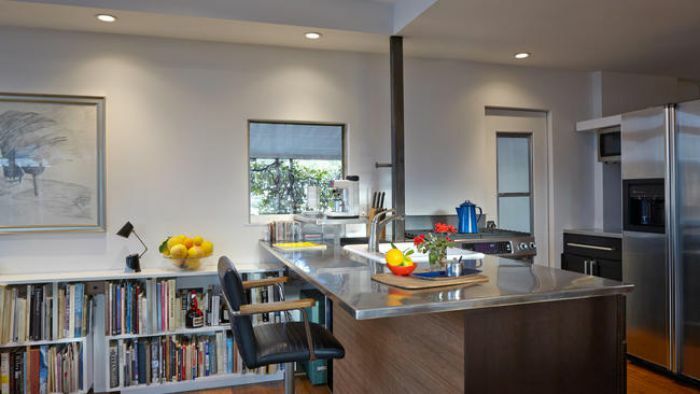 It took awhile but she finally found a 1964 double wide and transformed it into a dream home. The home set on a small lot which kept many people from being interested so Amy managed to snag the 800 square foot mobile home for a steal at $5,200. 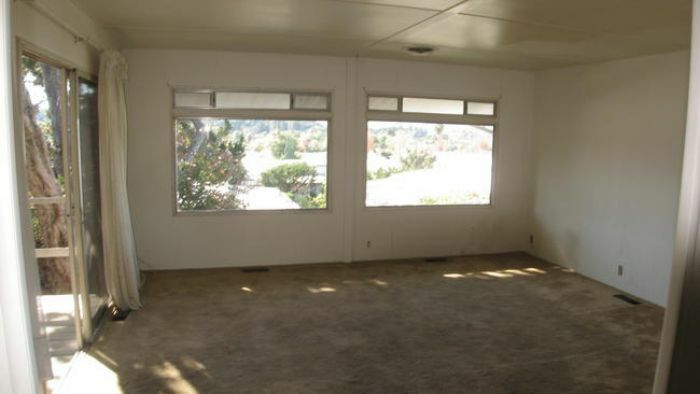 It took a little over a year and close to $200,000 for this complete 1964 mobile home remodel. Amy knew the home had tons of potential but would need to be stripped to the bare minimum first. an addition and second bathroom were part of the remodeling process. As you can see by the pictures Amy was able to pull together an absolutely stunning home from the complete 1964 mobile home remodel. She can both work and live in this gorgeous home. 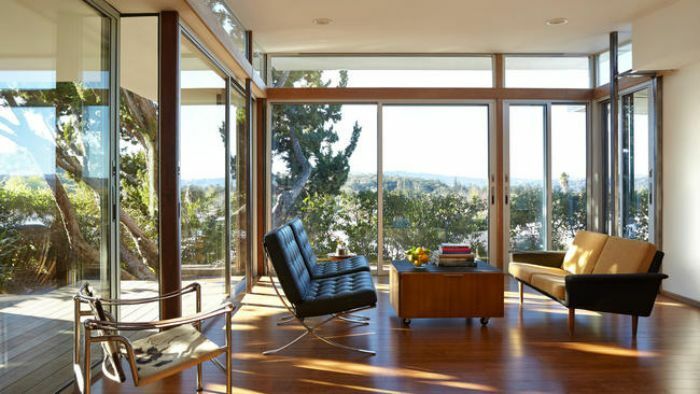 Her favorite feature in the new home was the addition of the floor to ceiling glass panels. 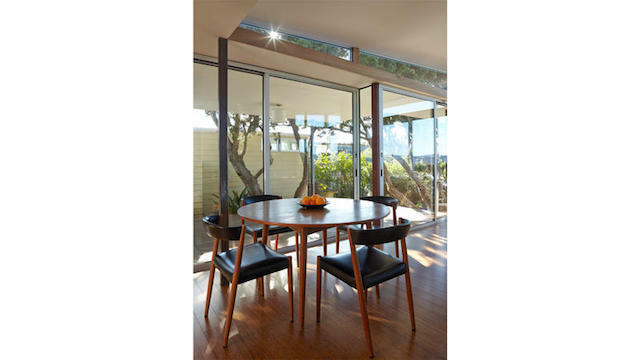 These provide the living room with an abundance of light. Although she is most proud of the glass it also came with a hefty price tag of $40,000. The final price was a little more then she had hoped at $180,000. However, Amy now splits her time between LA and her coastal paradise and is confident she made a great investment. In California, older mobile homes are going for well over $180,000 without any kind of remodeling so this may be a real investment income for her. Read about Southern California’s house bidding wars here. 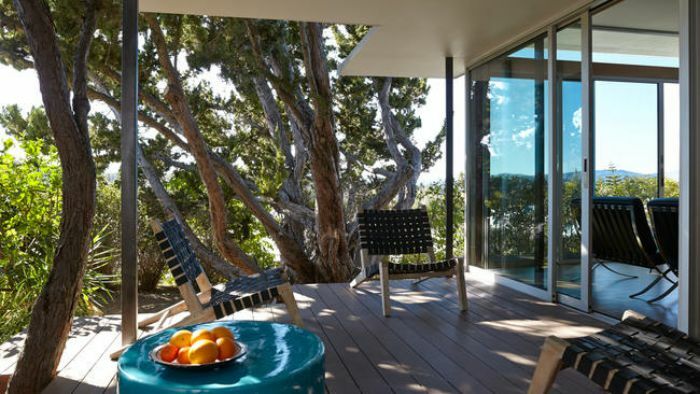 See a gorgeous Malibu double wide remodel here. The median home value in Los Angeles is $632,000. Los Angeles home values have gone up 7.6% over the past year. Zillow predicts they will rise 1.8% within the next year. The median list price per square foot in Los Angeles is $476, which is higher than the Los Angeles-Long Beach-Anaheim Metro average of $408. 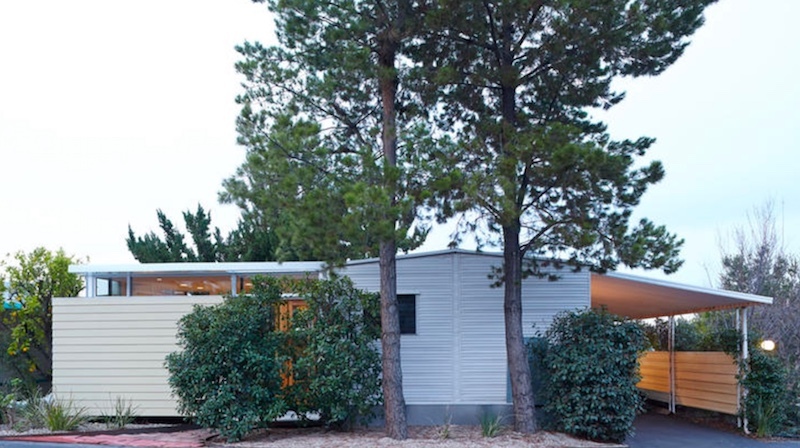 The exterior of Amy’s complete 1964 mobile home remodel is a great example of modern lines and clean materials. 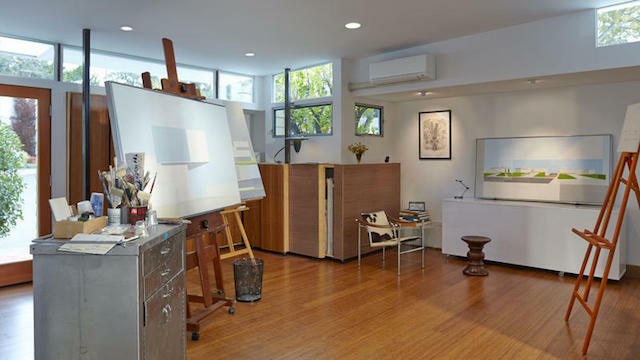 Have a home remodel you want to share with us? Comment below or send us an email. We would love to share your success with our readers! And as always, thanks for reading Mobile Home Living. I love anything you show with lots of windows. I want to buy an older home and add lots of windows…..is that a problem to do? It’s not too difficult to open up siding for windows but it is a tedious process. As long as you’re not going to large and altering the exterior wall too much you should be able to get a new window framed and installed in a day with help. Once that first one is figured out the others will go faster. Electrical could complicate matters a bit. My jaw dropped when I saw the first set of before/after pictures. Amazing transformation. So jealous! Madera County CA won’t allow anything like this! I would so love to remodel an older mobile. I think they must get kickbacks from the manufacturer s as you cannot even place one unless its 1984 or newer, even if from within the county. The fees are very high for putting one in, more than the cost of the home. We are going to pitch a tent!